There are many more like Gorgonia lost in the darkness of sin. Will you help us reach them with the Gospel? When a Global Baptist Church Planters Pioneer came to my village and preached the Gospel of Christ, I realized that hell was waiting for me if I would not receive Jesus. That day, when Pastor Ernie showed me from the Bible how to get saved, I received Jesus into my heart. He also showed me from the Bible that I should be baptized after I was saved. My ten children contested my plan to be baptized, but I was baptized because I would rather obey Jesus than my children! I am a happy and faithful Christian now. I thank God for American missionaries like Brother Rick Martin, who train Filipinos to become pastors. 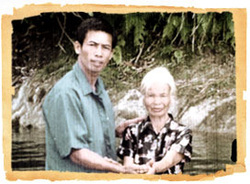 Because of these Filipino pastors, many people in mountain villages like mine have been saved. God used Ernie to bring Gorgonia to our precious Savior.